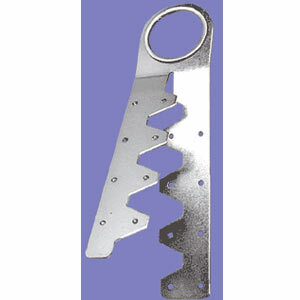 Model # RASU1 - Galvanized steel anchor attaches to the peak of the roof using 16d (penny) nails and is designed to be cut off or bent over when the job is complete. (The entire anchor can also be removed and discarded after use.) The unique one piece design features a dimensionally correct connection point and is an OSHA-compliant anchorage point capable of supporting 5,000 lbs.